Although defending champion Novak Djokovic won in straight sets, he had to work for it. Fellow compatriot Viktor Troicki gave the world number one a decent test. Still, Djokovic carried the match 6-3, 6-4 to earn a place in the round of 16. Once Djokovic obtained the quick break for 2-0, there was a feeling that this session would be brief. Yet, Troicki wasted five break points which permitted his rival to consolidate for 3-0 in the initial set. The one break deficit proved to be Troicki’s undoing in the first set. In the second set, Djokovic again got up to an early break for 2-0. However, this time, Troicki capitalized on break point and went on to square the set at 2 all. The order of play for Saturday at the Sony Ericsson Open is stacked with marquee matches. Action gets under way with five-time Miami champion Serena Williams facing of with Roberta Vinci. Andy Roddick will also be in action taking on Gilles Muller. Roger Federer begins his campaign to add another Miami title to his resume when he takes on Ryan Harrison. Sharapova will round out the day matches on Stadium court in a match up with Sloane Stephens. The Grandstand court will also feature premiere matches with the likes of David Ferrer, Kim Clijsters, Mardy Fish and Juan Martin Del Potro scheduled to play. The night session is highlighted by 2011 Sony Ericsson Open champion Novak Djokovic. Djokovic will play his first match in Miami against Marcos Baghdatis. The night session concludes with Samantha Stosur versus Chanelle Scheepers. The U.S. summer hardcourt series got under way this week with the Atlanta Tennis Championships. In a replay of last year‘s final, Mardy Fish and John Isner collided in the ultimate match. The result was similar as Fish vanquished Isner 3-6,7-6,6-2 to defend his trophy. With the title in Newport a few weeks ago, Isner was trying to win back to back title for the initial time in his career while Fish was in his maiden final of the season. As a result of a double fault, Isner faced double break point to open the match. However, by finding his serve, Isner held. Later on, when Fish’s forehand sailed long on break point, Isner took a 3-1 lead. This was the difference in the first set, as Isner went on to guard serve and carry it 6-3. With a forehand miscue by Fish on break point, Isner capitalized and secured the initial game of the second set. Soon though, with a backhand down the line winner, Fish manufactured double break point. When Isner double faulted, the players were back on serve. Since neither contender could fabricate another break point, the second set went to a tiebreaker. Subsequent to getting the initial point, Isner got on a roll and built a 5-1 advantage. Then, with a powerful forehand, Isner forced Fish into a mistake to obtain double championship point at 6-4. Yet, by pushing his backhand long and with Fish thumping an ace, Isner watched two chances combust. Promptly, with a superb backhand crosscourt volley winner, Fish had set point. Next, as Isner hit a forehand wide, Fish captured the second set. At the start of the previous set, Isner seemed to be suffering from the heat. On the other hand, Fish looked like he had hardly warmed up after tiebreaker. Consequently, Isner would need to draw on all his reserves to pull off a victory. With Isner double faulting, Fish arrived at double break point. When Isner’s backhand dropshot missed its mark, Fish banked the opening game of the decider. After Fish consolidated with a love game, Isner easily guarded serve to stay one game behind. With Fish serving at 3-2, Isner struck a nice backhand down the line winner for double break point. Still in the longest rally of the afternoon, fatigue bested Isner causing him to send a forehand long. Ultimately, Fish maintained serve and extended his lead. When Isner double faulted on break point, Fish had a 5-2 edge. After quickly reaching triple match point, Fish crushed a forehand crosscourt winner to claim the championship. 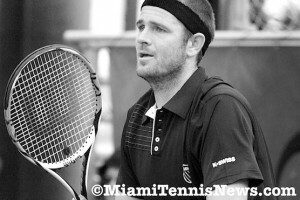 Fish stated that he was “lucky” to come away with the win because “nine out of ten times when John is up a set and a break, he will close it out”. Furthermore, Fish expressed he cannot remember Isner ever surrendering a tiebreaker after a 5-1 advantage. Fish admitted that fitness was in part a factor “I felt great. . . I pride myself on my fitness now”. This upcoming week, Fish will be the top seed at the Farmers’ Classic. Juan Martin Del Potro, the 2008 champion, will make his summer hardcourt debut as the second seed at the same event.